With all of the hype surrounding Majora’s Mask 3D, many fans have been enjoying a nostalgia kick and pondering all of the components that made Majora’s Mask so enjoyable. One of these would certainly be the music, which always fit the different scenarios so well that it helped immerse players into the atmosphere of Termina. 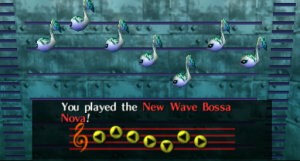 Musician Michael T. Samson recently arranged an extraordinary addition to the multitude of Majora’s Mask medleys out there. Samson’s orchestral rendition “The Legend of Zelda: Majora’s Mask” elegantly takes listeners through Link’s adventure, and is a must hear for any fan of Majora’s beautiful music. The medley begins with Clock Town, then the Deku Palace, Stone Tower Temple, Calling the Four Giants, Final Hours, Majora’s Wrath, and closes with the Song of Healing. Every song transition is seamless which makes the arrangement incredibly engaging. Samson feels Majora’s Mask to be one of his favorite video games, and it comes through in this medley. The whole piece has a personal feel to it, and I dare say I like it better than even the Symphony of the Goddesses’ “Majora’s Mask Suite”. This was conducted by Matt Sadowski and performed by the Ithaca College Gaming Symphony Orchestra. And as mentioned, the piece was arranged by Michael T. Samson. Samson graduated from the Ithaca College School of Music in 2014 with a Bachelor of Music degree in Music Composition, and has always found music in video games to be a powerful interactive art form. He also founded, directed, and conducted for the student-run Ithaca College Gamer Symphony Orchestra. If anyone wants to use this arrangement, or find more out about Samson, visit his website. How did you like this medley? How does it stack up to other Majora’s Mask medleys? Would you be interested to hear more from the Ithaca College Gamer Symphony Orchestra? Express your thoughts in the comments!